I'm running ZFSguru as a home NAS server for over 3 years now. You are using an ATX power supply, which should not be necessary for your power budget i think. You might consider dropping it and using a PicoPSU instead. This will make some serious gains in most cases. Your C60 should net about 12-15 watts idle i think. I like to start bare and then add things to see how much it adds to the total. Your IBM M1015 also consumes about 8W, which is quite a lot. So then it is 20-23W. With the fans 25W, with SSD 26W. With ATX power supply 35W or something. So it is about right what you say. 1. do you really need the IBM M1015? Your board has 6 SATA already so only one more needed for SSD. You could also partition your disks so that only disk1 has the OS on it, with a 10GB partition. Then the other drives can go in spindown. 2. your disks are not really power efficient, i like my WD Green 6TB drives for storing a shitload of data at only 3-4 watts idle; Your Seagate is not always idle because it does BGMS - Background Media Scanning. You do not need this feature for ZFS but it cannot be disabled. I do not like Seagate all that much. 3. your motherboard and CPU is rather old. Instead of doing hardware tweaks, you might consider going for a cheap but more modern board with internal DC-DC power supply. 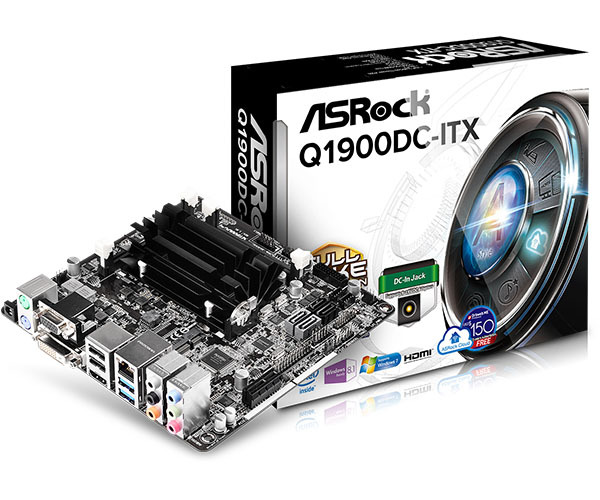 Such as the ASRock Q1900DC-ITX which is a rather cute board. I did some tests and you can go over the power budget spinning up multiple drives. But i suggest to avoid the IBM M1015. Or think about two servers: one less power efficient that is usually offline, and one that is 24/7 online but has only one drive and is extremely power efficient. That is close to what i am using. Like: have a DC-DC board with one WD 6TB without redundancy, and sync it over the network with your less power efficient server. This way you buy new stuff but still use the older stuff you have. You use less power because the old server is offline most of the time. Besides you also get faster quadcore processor instead of the very slow dualcore 1GHz the C60 offers. It has to run on its toes just to serve data across gigabit. But it is still useful with my proposition. Note the small black round power-plug at the far left, that is how you supply power to this board. No ATX power supply needed! Most of the hardware in this current setup was recuperated from other builds and therefore quite cheap in total cost. It's true though that it is outdated to current standards! Intresting tip about running 2 servers, 1 solely as 24/7 media server and the other (current server as backup). Sure and let me know if i can be of more help. I like to think about other people's builds. And builds like above are something i propose regularly on the Dutch techforums. I am using these builds myself as well. I have quite a few of them. So let me know if i can help you more with anything. Consumption detect by the power of the home in the server can be most declared of the greetings on spin to all the drives. Power always down by the spinning way so british dissertation writers can be only inherit the instructed to the running.